We’ve heard that some of the best beef comes from Kansas (try one of our burgers and we think you’ll agree). 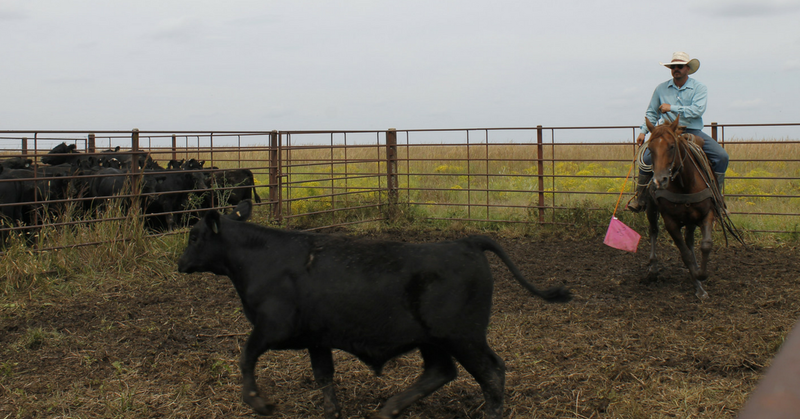 We traveled to Creekstone Farms, right outside of Wichita, KS, to find out why. 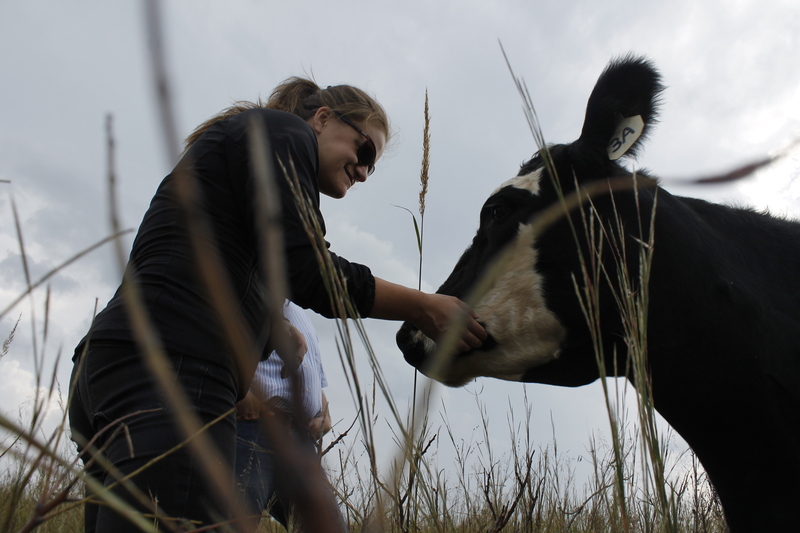 Caitlin hand feeding one of the heifers. Our friends at Creekstone took us around to see some of the ranches first hand. We don’t just take our vendor’s word (although Creekstone’s product already speaks for itself), but rather like to ensure that all stages in the process promise the same quality in every cut, every burger, every bite. Director of Purchasing Caitlin McMahon enjoys getting down in the dirt with a lot of our purveyors and Creekstone was happy to oblige. We had the joy of visiting Triple Creek Ranch out in Winfield, KS, where we do believe some of the happiest cows in the world live. Kevette, owner of the Triple Creek Ranch, showed us around the farm and introduced us BY NAME to all of her cattle. There was Bebe, Three Baby, Pinto Bean and Jelly Bean to name a few. We have honestly never seen anything like it – she’d call them out, and they would sure enough come running! Someone got caught with her head in the cookie jar! It’s quite an experience to have a dozen well-fed, yet hungry cows running toward you. Luckily they were just after the nuggets of cow treats we carried with us. They liked them so much so, that when we had our backs turned, one of the girls got into the back of the buggy, knocked over the food container and started to indulge profusely. We tried to pull her head out of the treat bucket, but that is not as easy as it seems! These cows ate right out of our hands…another purely unique and oddly enjoyable experience. They were so sweet and yet quite stubborn, and had the body weight to push you around if they feel like doing so. These were some happy heifers. We also were able to visit JBL ranch on our trip, which raise cattle on a much larger scale. This ranch gave us an idea of just how much land it actually takes to raise grass-fed, all-natural cattle. SPOILER ALERT: It’s a lot. It took a solid 15 minutes of driving to get from where the calves are raised to where the adolescents get to graze! The space it takes to allow them to roam, water and just be happy cows is enormous. But being up close and personal, and seeing how these animals get to run, move and soak in the sun, reminds us how important it is not to settle for anything less than grass-fed, grain-finished quality. Happy cattle need a lot of land to be active and healthy! Temple Grandin may argue the quality of beef comes from respecting the animal in every aspect. Her advances to the livestock industry were built on the simple rule that happy cows make better steaks. The Creekstone facilities and practices are all Grandin creations. A revolutionary in creating a more humane process for handling livestock, Grandin puts herself into the mindset of an animal by imagining what it feels and seeing what it sees. 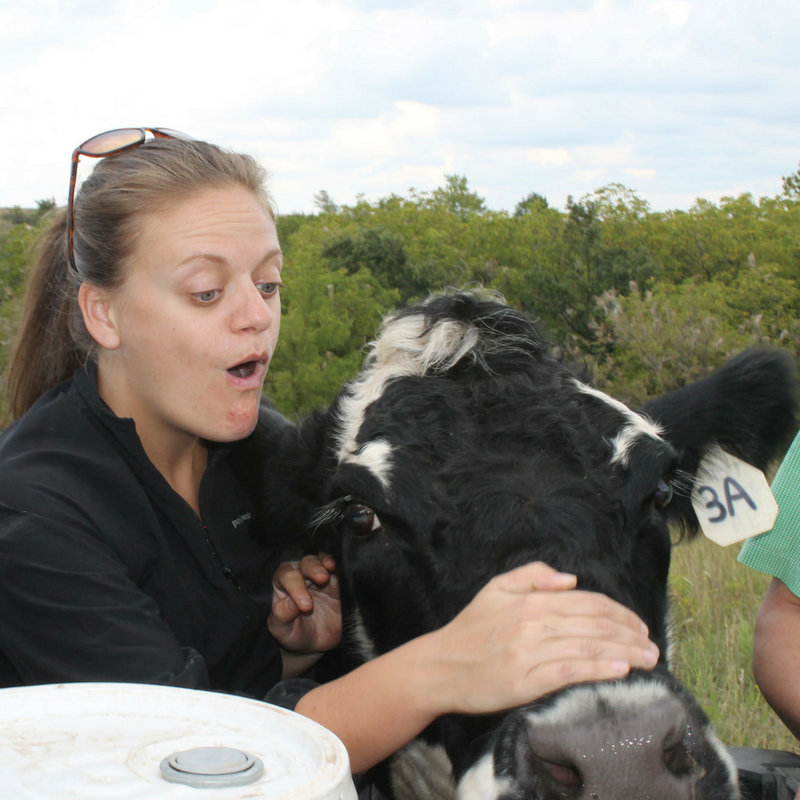 Her work ultimately brought forth new industry-wide practices like quiet and calm human handlers, letting calves stay with their mothers and other stress-reducing practices. Making sure that the animal is well taken care of and stress-free is critical to a quality product. Getting a drink from mom. 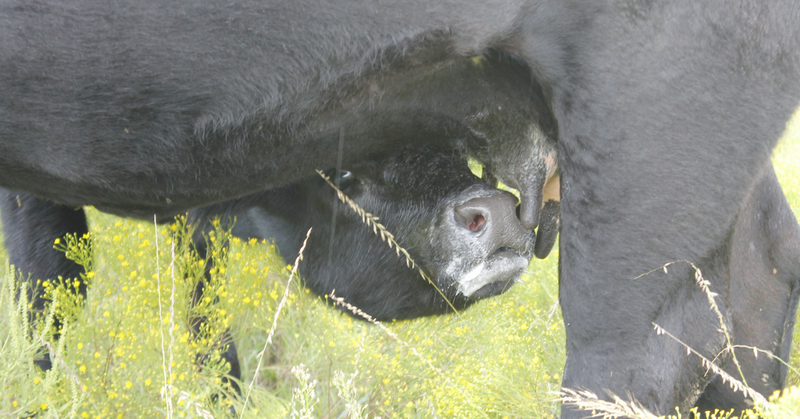 Some though, may argue that the key to the sumptuous beef is the grass. Kansas has beautiful swaying fields of grass – the kind with roots that grow deep. What you may not know about free range cattle is that they just love the bits underneath the soil…the extra juicy pieces. The deeper the roots the happier the cow. And we are talking about an animal that can easily eat 25 pounds of grass every day! 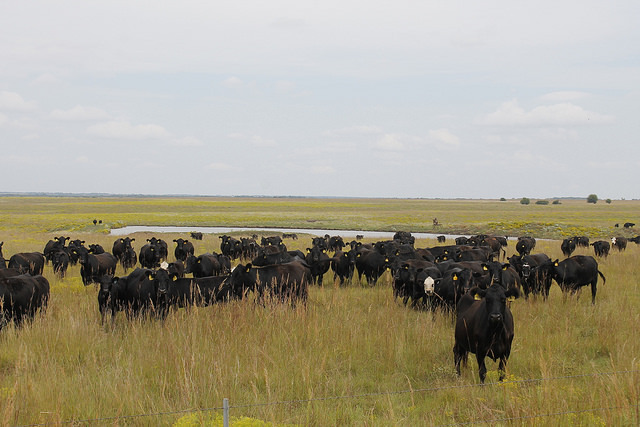 We’ve heard more than a few people argue that this nutritious grass – and its abundance – is what makes Kansas’ beef the best in the country. Cowboys use flags and hand signals to avoid having to shout or use cattle prods. Personally, we tend to think it’s the love put into every step that makes their beef taste so great. That, and the cowboys. Kansas grows some beautiful cattle and some beautiful cowboys. Temple Grandin’s designs weren’t limited just to the pastures. We were able to see how reduced stress and care for the animal fits into the processing as well. As important it is to reduce stress during the animals’ life, it is just as important to do so at slaughter. By looking at things from the cow’s perspective, literally getting on hands and knees trying to get a deep understanding of what the cattle experience, Grandin’s facility is one of the most humane systems known. 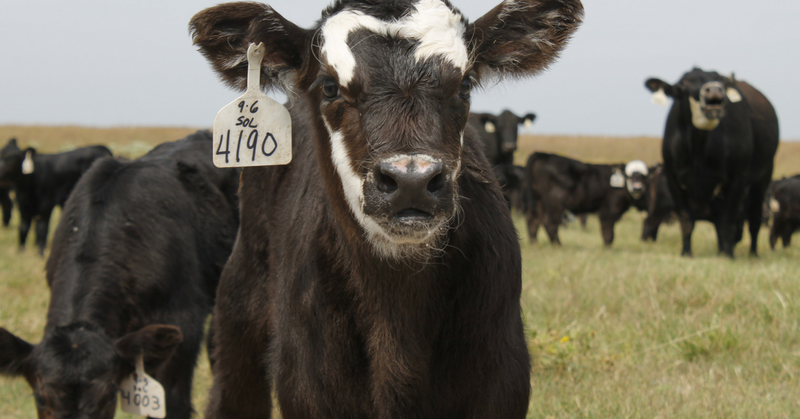 Calves are less stressed when they are able to stay with their mothers. It can be quite intimidating being in the slaughterhouse, but seeing the way the cattle were cared for put us at ease. The whole process is quiet and a bit peaceful in an unexpected way. Being able to experience the entire process from pasture to package gives us not only the assurance that this is the best product we can find, but it also allows us a deeper respect and understanding for the food we love. We take a lot of pride in ensuring our products are treated with respect and care, and follow that all the way to your plate. Check out this cool post by Tupelo Honey!